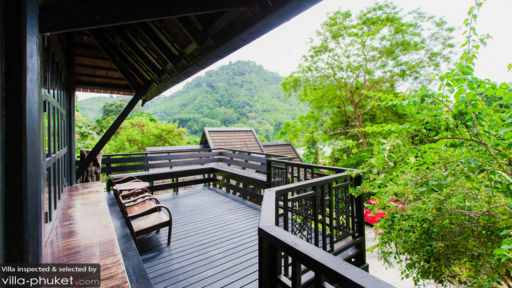 Located inPatong famous for its neon nightlife, as well as close to Patong beach, the trendiest hub of Phuket, Star Path Villa is a three-bedroom holiday home, part of Patong Hill Estate, overlooking views of lush tropical vegetation. Enjoy a relaxing and private vacation with your loved one in this oasis in the middle of nowhere. If you wish, you can always head out to explore the bustling nightlife of Patong, or else, stay indoors and unwind amidst natural surroundings while breathing in the fresh air! The villa is a three-bedroom home with a lavishly furnished and decorated, with air-conditioned. The master suite is having a queen-sized bed. The inviting vibe in the bedroom is owing to its traditional décor featuring an excellent Buddha painting, wall hangings, and simple fittings. The en-suite bathroom is fully-fitted with necessary amenities including a soaking bathtub and shower head. The two bedrooms are well-furnished and air-conditioned as well, as they have plush queen-sized beds on which you can rest till morn’! The hardwood floors really add a luxurious ambiance to the room along with wooden wall-panels and wall hangings! There are en-suite bathrooms for each bedroom fitted with necessary amenities. A beautiful property, Star Path Villa features a lavish sun deck out in the open air with a freeform common swimming pool where guests of the complex can come together, relax, and lounge all day on the sun chairs. Under the hot tropical sun, lie back and take a nap as the fresh air reverberates around you. The clear blue skies beckon as you look up from your comfy spot, and you will feel truly refreshed and rejuvenated, which ultimately gives you what you need from your tropical adventure! With remarkable views of the neighboring regions, you will feel as if contained amidst lush greenery all around, protecting you from everything else. The two-storeyed Star Path Villa features a traditionally designed living area which overlooks the stunning views of the island. 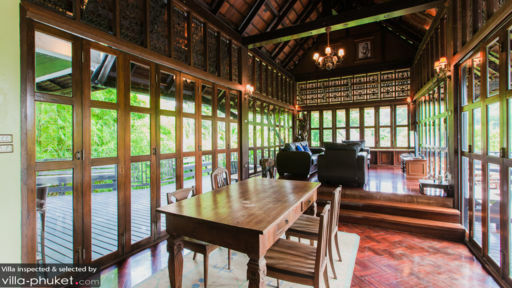 Decorated with ample artefacts and things from around Thailand, the cozy living space is ideal for hanging out with friends and family, as you enjoy the calm and tranquility of your personal haven. Large windows ensure the room is well-lit with natural lighting, and the comfortable sofas are there for you to lounge on. As you ascend the steps, you will reach another corridor that has been littered with décor that speaks volumes of Thai heritage and culture. For your enjoyment, you will find a flat-screen TV and DVD player, already hooked in. In one corner, you will find the dining area and kitchen which is in the middle of a sunny room. The 2-seater dining table is a romantic affair, perfect for honeymooning couples and with a fully-equipped kitchen rest assured that you have everything you need at hand. You can cook and prepare fresh meals for yourself and your partner, dig in heartily and have a wonderful time all around. You can directly head outdoors to the pool area and splash around to your heart’s content. There is a spa service for guests of the complex, where you can indulge in massages and spa treatments. Apart from the common pool, there are a lot of fun activities to be done around Patong and the friendly staff at the villa can help you book for tours and excursions. There is laundry and daily housekeeping at the villas. 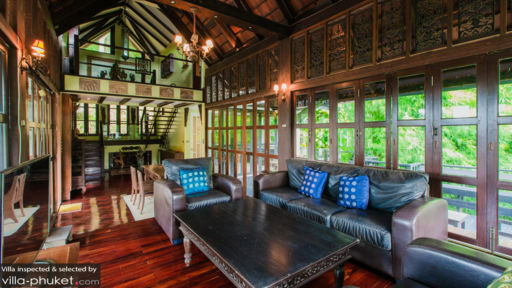 The villa is merely 600m from the famous Patong Simon Cabaret. Patong is a great place to meet people, dance, drink, and party all night long. There are several restaurants and clubs at a stretch that guests can explore. Bangla road is also an exciting bit of Patong once the sun sets and the lights come on! Enjoy at the outdoor bars, discos, and go-go bars for a great time!